Gus Smith (vocals); Richie Emmerson (tenor); Ian Bosworth (guitar); Jeremy McMurray (keys); Adrian Beadnell (bass); and Mark Hawkins (drums); + Steve Walker (trumpet); and Ashley Walker (bass). 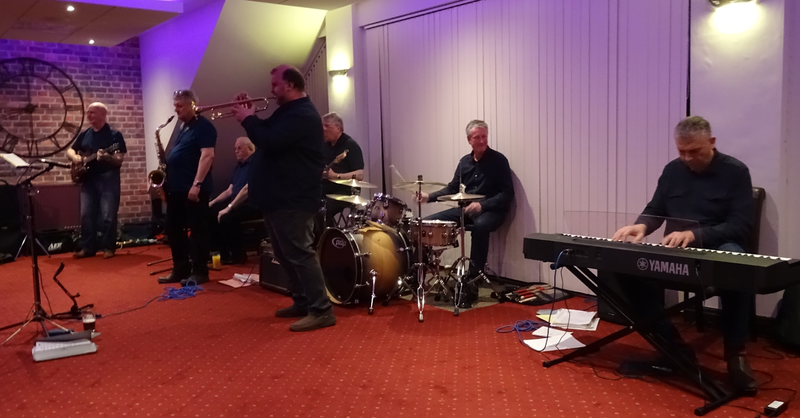 After a year of monthly gigs at Saltburn Golf Club the Jazz Lads celebrated in style. With Gus Smith providing vocals, the night started with a lively version of There Will Never Be Another You and a beautiful rendition of Buddy Johnson's Since I Fell For You. After a couple of instrumentals Sugar and Killer Joe, Steve Walker joined in along with Gus for When Sunny Gets Blue. Steve demonstrated what a fine horn player he is with a moving solo. The night continued with many numbers including In a Mellow Tone, I Can't Get Started, Take the A Train and finishing with Steve's son Ashley playing bass on Watermelon Man. Saltburn Golf Club is an excellent venue, good acoustics and plenty of car parking. It was a pleasure to be in the plush surroundings, listening to such fine musicians play to an enthusiastic audience which has built up over the year ensuring its continuation.